* Keep all of your grinding equipment and meat very cold. I throw everything in the fridge a few hours before I start, the grinder, the plunger, the bowl that I'm grinding into, everything. Two reasons for this: Food safety and to keep the fat from starting to render out of your sausage. The motor heats up quite a bit. If your making a large batch, keep half of the meat in the fridge until you need it. * Now that your casing is tied, turn your motor on low and start plunging some ground meat through. I'm right handed so I feed with my left and form the link with my right. As the meat feeds in, gently squeeze it to the tied end with the back of your hand while holding the tube to prevent air pockets. Not too much or the casing will break, not too little because your links will look like they need Viagra. I fill the casings pretty tight, it takes some practice though. Keep doing this until, in the case of Andouille, you have about a ten inch link, turn off the motor, pull out the casing about 2-3 inches and cut it. Now form the end of the sausage and tie it. You can adjust your motor speed to your pace. * If you want a rope of smaller links, you can make one long casing, then pinch & twist between each link, then tie each division with butcher's twine. Just make sure you don't pack as much into the casings or they will burst. * Don't sweat air pockets while you're linking, finish your link, then worry about it. Simply take a toothpick or skewer and poke the air pocket, just a tiny hole, then gently rub it until the air is gone. * You now have fresh sausage. I tie butcher's twine around one end each of two links, then hang them from hooks in the basement to cure. I will keep copious notes on my smoking experience today and share them tonight. 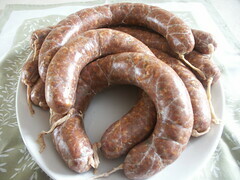 I love this site and one reason I loged on is to make somodat andouille. I love the stuff and can't find it anywhere. Thanks for the linking info since I am new to it. I have been looking to do this for a long time. Thank you!